Welcome to Creative PTC Script! Creative PTC - All in One Script for PTC, HyIp, Crypto Trade & Money Investment which allows you to earn money in so many different ways. This Scripts has lot’s of features to serve your customers. 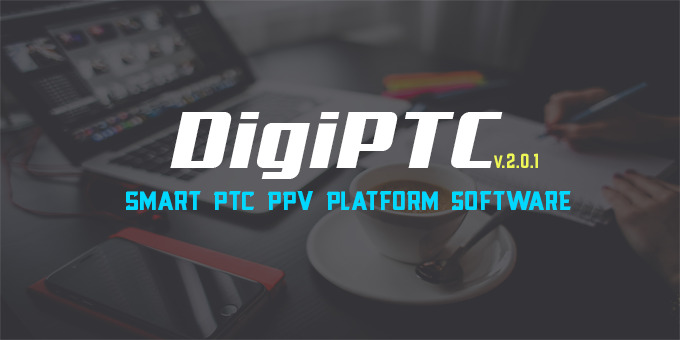 Such as Paid to Click (PTC), Pay Per View (PPV), Crypto Currency Investment, HyIp Investment, Any Currency Investment Like USD, Euro Etc, Perfect Membership System, Cool Referral System. With Creative PTC | All in One Script for PTC, HyIp, Crypto Trade & Money Investment System it will be easier than your thought. 1. Live Latest User’s Deposit & Withdraw info on Homepage. 2. Live Latest User’s Withdraw Page. You can call Payment Proof. 1. Timer on Paid to Click View with Animation Progress and Fixes some bug on this features. 2. Earn Money by View Youtube Videos. Also support Google Adsense Ads on View Page with timer and Animation Progress. 3. User Can Earn Money By Invest Their Any Crypto Currency Also Supported Normal Currency. You can call this feature like HyIp, BitCoin Doubler, Investment ETC. 5. Fully Working Membership System. I Fixes All Membership Bugs. 6. Instant Money Deposit System. 7. Offline Money Deposit System. You can call this Local Payment. 8. Huge update on Referral System. Such as User Sign Up Bonus, Sign Up Bonus on Who Share Referral link and Who Sign up bu That Link. Deposit Bonus By Referred User Deposit. Earn Money By Referred User PTC and PPV View, Earn By Referred User Membership Upgrade. 9. Money Transfer System. User Can Transfer Funds Deposit, Referral, Account Balance to Deposit and Account Balance. Also Can Transfer Funds Member To Member With Email Notifications. 11. User Can See their Investment Interest History, Fixes Some Bug User Withdraw History and Deposit History. 12. User Can See Referred Users Paid To Click, Paid To View Video Ads, Membership Upgrade, Deposit Bonus and Self Earning History on Earning History Option. 13. Profile Page and Email Verify. Also add User Identity Verify and Proof of Address Verify. You can call it KYC Verify. 14. Auto Email Notify When User do Login, Create Support ticket, Receive Support Ticket Reply Form Admin, Sending Money To Other User, Receive money from other user, KYC Verify ETC. 1. Paid to Click and Paid To View. Admin Can Set Time, Set Ads Specific Membership on Paid To Click And Paid To View, ETC. 2. Admin Can Send Emails to Any user on his site. Also Can send any outsider people from Admin Panel. No Need to go gmail or any others site for send emails. Admin can see All Emails from his Inbox on admin panel. 3. Admin can see, edit all website user profile other any kind data. Admin Can Create a new user with any trouble. Just put email and name that’s it. System Automatically create his temporary Password, other’s data and send that info to email address. After user get their email and login that info system will tell him force change their password with update profile data. 4. Fully Featured Blog/News/Promotion/Article/Event System with Category and Tags. 5. Fully Featured Investment System. Admin Can Create Investment Plan with Minimum and Maximum Invest. Can Be Set Hourly,Weekly, Monthly Any kind Time Based Duration with Return Investment Interest Percentage. Also Can set how many time user get their interest. Admin have to fill that info. System will automatically do that job. 6. Admin Can Create Fully Featured Membership System such as set renew date, price, duration etc. 7. Admin Can Set Instant Payment Gateway Fixed and Percentage fee. Active and De-Active Gateway Status. 8. Fully Featured Local Gateway it means Admin Can Create Any Kind Payment Gateway with Gateway Fixed and Percentage fee, Active and De-Active Gateway Status. Much More. 9. Fully Featured Deposit System. Admin Can See Latest Instant Deposit, Verify their Local Payment deposit, accept and reject payment with fraud deposit. 10. Now User Withdraw System. User request withdraw and admin send money then just need click complete button. That’s it..! 11. Fully Featured User Support Panel, Admin can reply his user support ticket and see closed support ticket. 12. Know Your Customer (KYC), Yes it is for Verify user Identity and Proof of Address. User Submit their National Identity Card, Passport, Driving License and Other Docs of Proof of Address, Admin saw that request on admin panel and accept or reject his request. 14. Fully Featured Website Settings System. Admin can Edit Site Name, Site Tile, Company Name, Contact Email, System Contact Email, Company Address, Contact Phone, Disqus Comment System, Live Chat System on Admin Panel without any code. 15. Admin can be Turn On or Turn Off any website Features with one click. Such as Paid To Click (PTC), Paid to View (PPV), Payment Proof Page on homepage, Latest Deposit and Withdraw info on homepage, Member to Member Money Transfer, Membership System, Investment System. This feature can be Off or On anytime from Admin Panel without any code. 16. Admin Can set Minimum Deposit, Minimum Withdraw, Maximum Withdraw, Self Transfer Commission fee, Member to Member Transfer fee, Sign up bonus, Referral Link Share Bonus, Referred Sign up Bonus, Referred Deposit Bonus, Referred Membership upgrade Bonus, Referred Paid to Click and Paid to View Bonus ETC. Note: If You Can Not Find Satisfied Features in This Script Then Please do not go away without submit suggest. Just comment or contact with us for request to add features that was not in current version. We will try to add that features in next update. Safety always comes first. We are prepared for scammers trying to hack our Creative PTC script. Your customers are fully secured with Creative PTC. We make every effort to ensure that our customers receive a fully secure software that will bring benefits for them instead of the nerves and worries associated with scammers trying to steal their money. All you need is just a hosting supporting PHP and MySQL, like 99% hosting offers on the market. We do not require some alien technologies. We are providing 100% open code (front-end and back-end) so you can easily customize Creative PTC script. It is not rocket science; our script is made to be customized. Sick and tired of the scripts with no documentation at all? Well, we are that is why we provide you full documentation explaining how our Creative PTC script works. Creative PTC written from scratch, the most advanced Get Paid to Click script on the market. Made by people familiar with many PTC scripts and sites. PayPal, Payza, Neteller, SolidTrustPay, AdvCash, PerfectMoney, Payeer, Skrill, OkPay, BitCoin – Add all kind payment system gateway. You can start fully manually. You can also add your local payment system. Highly customizable memberships with connection to all settings on the site, you can set all values differently on each membership. Add Unlimited Membership in Creative PTC. Just Give some data and you are all set. Every Membership supports referral commission. Based on years of experience we know how cheaters are operating. We have systems to catch them and report all suspicious activity on the site. Safety & security is our top priority. Protect against fraud on every possible level. Very powerful and customizable News and Blog engine is included with the script. It does not require re-registration; it is hooked with the script. Use our built in ticket system with canned responses included. Let your users to see all ticket history, also available for outside customers. This and much more features are available in Creative PTC script. We have listed only the most important ones. We also have great referral system. You can set a lot of settings in our referral system. All of them are individual per our membership system. To find out what kind of other options we have just check out our demo.